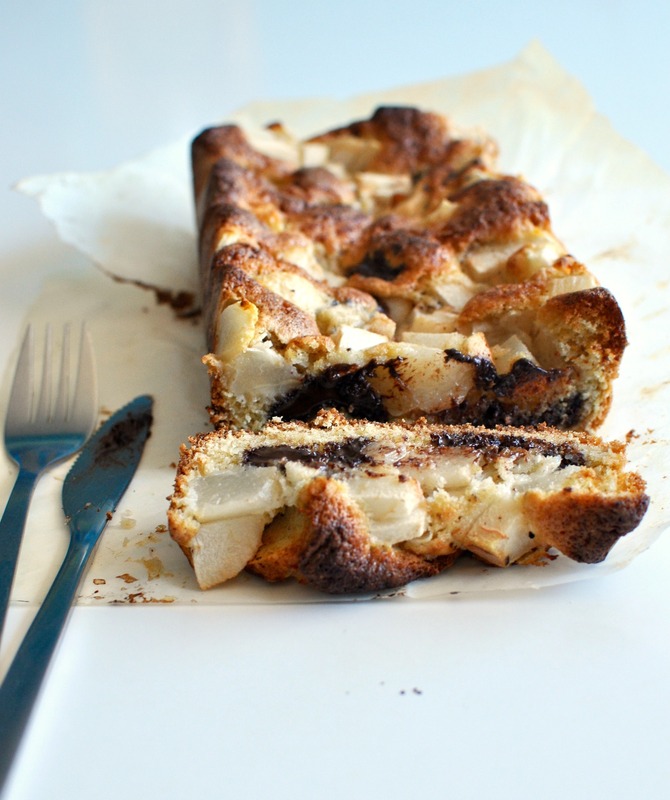 The batter gets its flavour from the browned butter and it is very generously studded with dark chocolate chunks and diced, ripe pears. They are sprinkled on top and become enveloped by the cake as it rises in the oven. I took a few slices and packed it in my purse to eat after we signed our papers. We went to a ramen restaurant and fed a piece to each other with chopsticks before we ate anything else. It was ridiculous, in the best way, and very tasty. We shared the rest of the slices with our friends and have been snacking on the rest of the cake ever since. 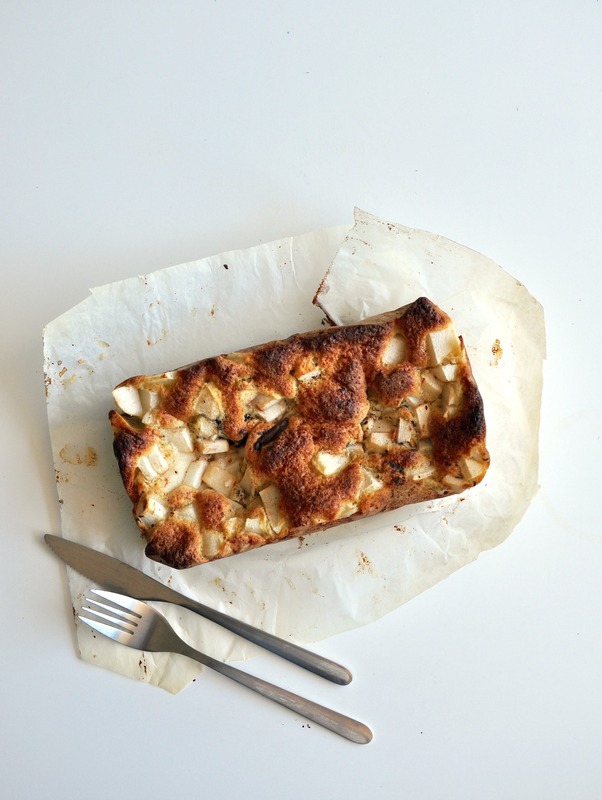 It’s a simple cake that has almost as much chocolate and pears as it does actual cake. It is just sweet enough and gets more moist after a day, as the juice of the pears continue to seep into the rest of the batter. If you ever have an excuse to make it, I hope you enjoy it as much as we do. Preheat the oven to 350°F and line a 9" x 5" pan loaf pan with parchment paper. In a large bowl, using an electric whisk, whip the eggs on high speed until pale and thick (it took me 10 minutes with my handheld electric whisk, Smitten says that with a Professional Kitchenaid, it will take closer to 5 minutes). While the eggs are whipping, brown the butter in a small pot over medium heat. Cook slowly, stirring occasionally, until the butter smells nutty and is brown (about 5 minutes). Remove from heat and set aside. As the egg and sugar mixture begins to lose volume, stir in half of the flour mix, then half of the butter, then the other half of the flour, and the other half of the butter (stirring in between until the ingredients are barely combined). Fold the batter using a spatula until the ingredients are just barely combined (you don't want to lose air!). 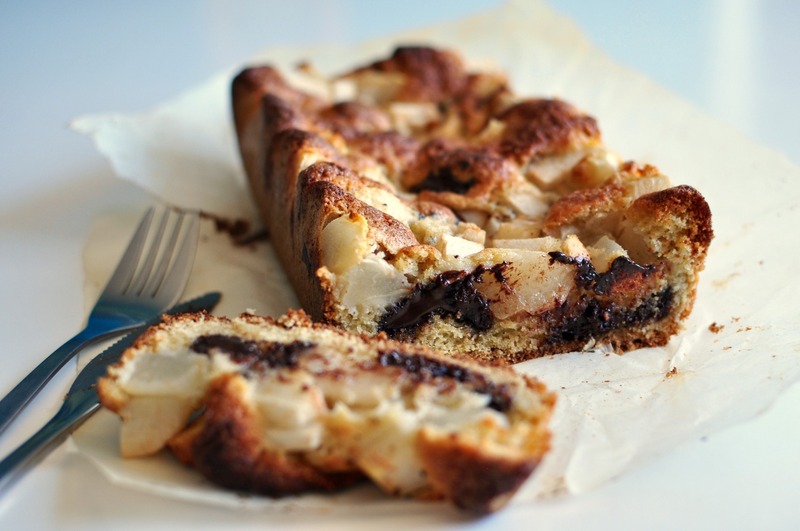 Pour mixture into the loaf pan and sprinkle with pear and chocolate chunks. Bake for about 35 minutes, until the cake is golden brown and a toothpick comes out clean.